Poi Luang Traditional A ceremony to celebrate various religious properties to achieve his aim was to support their families. It has very strong merits It is also used to show the unity of the monks and the villagers because it is a big job. This tradition is merit donate on behalf of their parents, grandparents or relatives who have passed away already. It's important to have merit Poy Luang is the joy together for fun and enjoyment to the local people by the entertainment and celebration. Because one year to have a chance to celebrate. Or some may take many years because some buildings create a very long time. 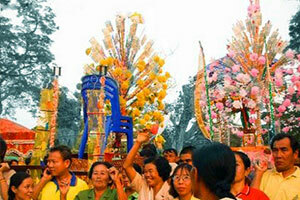 Wasting a lot of money Must wait for the completion and there is money to be celebrated as Poi Luang.